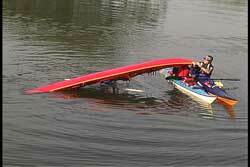 When the person in the water decides to climb onto the back deck of their kayak they can need two types of assistance. The most important is having their kayak stable so they can climb onto it. 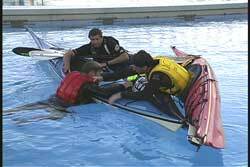 If their kayak is not held in position, it will roll when they try to climb onto it from the side. 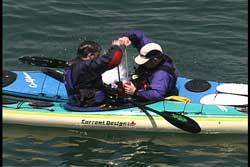 Stabilizing the kayak is the traditional roll of the assisting paddler. 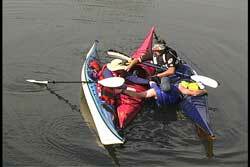 Keeping the kayak stable is vital, but it doesn't help the person in the water with respect to climbing on to the kayak. 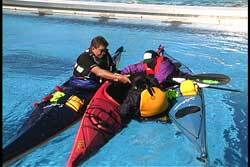 If the paddler in the water chooses to re-enter their cockpit from between the boats with the feet first method, then the second helper could reach across and grab a hand or a PFD. Even though I have very long arms (being so tall), I recommend grabbing the swimmer's forearm instead of the PFD. I find it is easier for most people to use the forearm grab because the PFD on the swimmer id pretty far out of reach for most people.